For any fans of this blog, you might remember that one of the less frequent categories I write is “Future Hall of Famers” In this section, I address someone who will eventually join the Hall but hasn’t as of yet. Articles detailing Rick Rude and Andy Kaufman have come out in the past. I’ve also done one on the topic at hand, the Man They Call Vader. Vader, without a shadow of a doubt, is a Hall of Famer in waiting. He was a multi-time world champion, both in USA and abroad, and all around one of the best, and most athletic big men in history of the business. Keep this in mind, at his height, Vader was well over 400 pounds. That is huge, only 100 pounds less than Andre the Giant, and yet you would never know that watching Big Van Vader wrestle. His credentials aside, this article has another reason, another cause and another purpose. 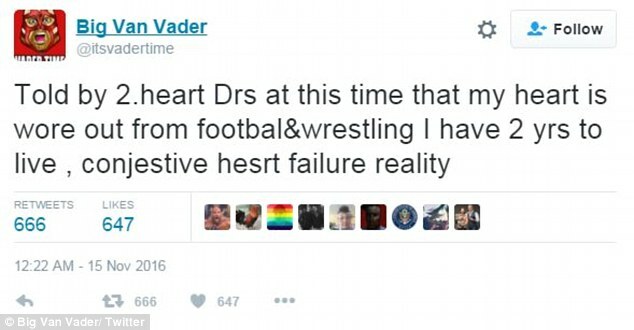 Vader must go in the WWE Hall of Fame now, do to his physical condition. Sadly, Vader is dying. Vader is suffering from a horrible degenerative condition which will eventually lead to his death and there is very little he can do about that. 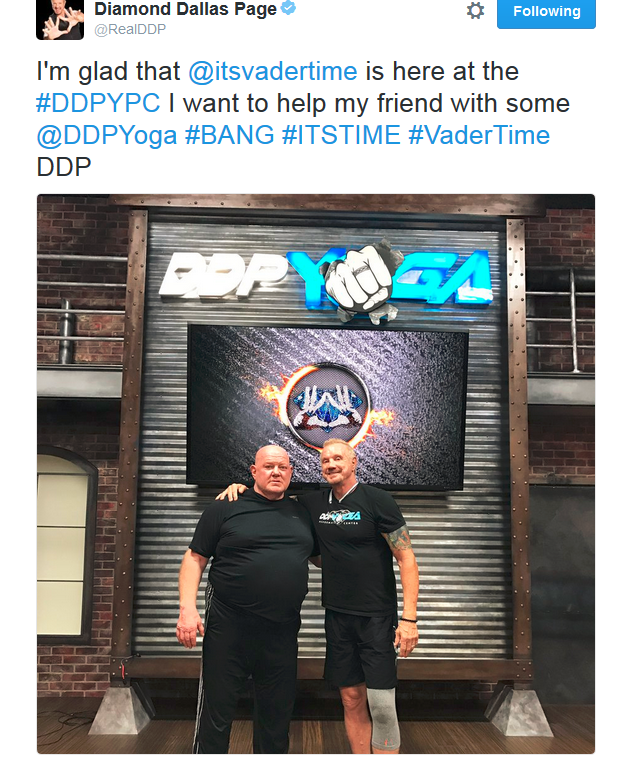 (Except for DDP Yoga?- Can DDP Yoga save Vader’s life? Let’s get to the point. 2017 is the time. Its Vader time for the WWE Hall of Fame. This must happen now. And I have one reason, dead wrestlers going into the Hall of Fame is always a bummer. Its very nice when we remember a long dead or a fairly long deceased wrestler, (Think Gorgeous George or Stu Hart or The Sheik.) However, when the wrestler died only shortly before their induction (because the Hall of Fame wasn’t active) like Curt Hennig in 2007 (died in inactive year 2003) its a bummer. The biggest bummers are when the WWE decides not to induct and the person died.The biggest and best example of that tragedy is The Macho Man Randy Savage. Remember the WWE HOF returned to active duty in 2004 and Savage died in May of 2011. He easily could have been the headliner any year from 2007-2011, specifically 2010 (which had no headliner) and 2011 which had only recently retired Shawn Michaels. There is no reason at this point that Vader isn’t automatic for this year. I would rather see Vader on stage getting his honors and giving the fans a chance to thank him vs the alternative. Even Mick Foley agrees. 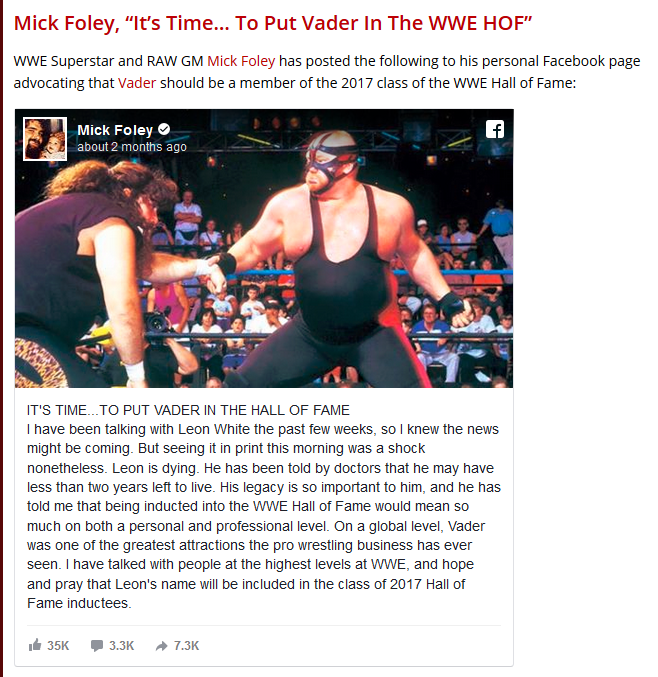 Upon Vader’s announcement, Mick Foley took to facebook to throw into support behind 2017 being Vader’s year. What do you think? Should Vader go into the Hall of Fame this year? This entry was posted in Opinion and tagged vader. Bookmark the permalink.